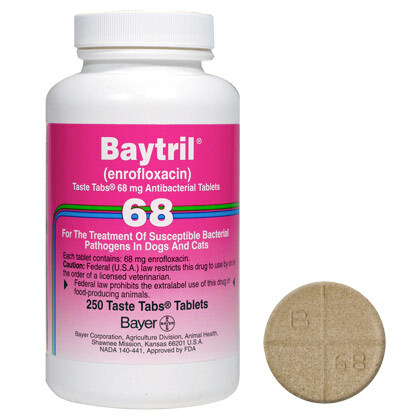 Baytril (enrofloxacin) is an antibiotic used to treat many types of infections caused by susceptible bacteria. Including urinary tract, skin, prostate, GI tract, liver, and lungs. Uses: Enrofloxacin is an antibiotic of the quinolone class. Dogs and Cats: It is used in the treatment of susceptible bacterial infections. Ferrets, Rabbits, Hedgehogs, Chinchillas, Hamsters, Gerbils, Guinea Pigs, Mice, Rats: Enrofloxacin may be used to treat bacteria and mycoplasma infections. Reptiles: Injectable enrofloxacin may be used to treat bacterial infections, especially of the respiratory system. Possible Side Effects: May see lack of appetite, vomiting, diarrhea, dilated pupils (in cats), and seizures in animals with central nervous system (CNS) disorders, such as epilepsy. May also see depression, dizziness, nervousness, or other behavior changes. If you observe any of these signs, contact your veterinarian. If your pet experiences an allergic reaction to the medication, signs may include facial swelling, hives, scratching, sudden onset of diarrhea, vomiting, shock, seizures, pale gums, cold limbs, or coma. If you observe any of these signs, contact your veterinarian immediately. Precautions: Do not use in animals hypersensitive (allergic) to it or other quinolone antibiotics and/or sulfonamides. Cats: Use with caution. Do not exceed 2.2 mg/pound per day. Higher doses can result in altered vision or blindness. The safe use of enrofloxacin in breeding animals or pregnant or lactating animals (female animals nursing their young) has not been evaluated. May cause problems in the development of bones/joints of young growing animals, including large breeds of dogs under 24 months. Only use in growing animals, if under the supervision of a veterinarian. Do not use in animals with central nervous system (CNS) disorders, such as epilepsy, as it could possibly cause seizures. Use with caution in pets with liver or kidney disease. In pets taking enrofloxacin, dehydration increases the risk of seizures and crystals developing in the urine. Make sure your pet has access to clean drinking water while taking this medication. Enrofloxacin causes hallucinations in people, and may worsen signs in animals with obsessive behaviors. People with hypersensitivities (allergies) to quinolone antibiotics, such as ciprofloxacin or norfloxacin, should not handle the medication, since a photosensitivity reaction could occur just from contact. Contact your veterinarian regarding physical examinations and laboratory testing necessary prior to and during treatment with enrofloxacin. Drug, Food, and Test Interactions: Consult your veterinarian before using enrofloxacin with vitamins and supplements, probenecid, oral cyclosporine, since interactions may occur. Do not use within 2 hours of giving antacids, sucralfate, or iron, aluminum, calcium, or dairy products, as absorption will be decreased. May cause increased theophylline blood levels. Signs of Toxicity/Overdose: May see lack of appetite, vomiting, or diarrhea, dizziness, dilated pupils or blindness (in cats), seizures in animals with central nervous system (CNS) disorders, such as epilepsy. If you know or suspect your pet has had an overdose, or if you observe any of these signs in your pet, contact your veterinarian immediately. Keep this and all other medications out of the reach of children and pets. ** This information may not cover all possible uses, directions, side effects, precautions, allergic reactions, drug interactions, or withdrawal times. Always consult your own veterinarian for specific advice concerning the treatment of your pet.